Today, the Metro Board of Directors’ Executive Management Committee approved changes to the way the agency partners for development on Metro-owned land. 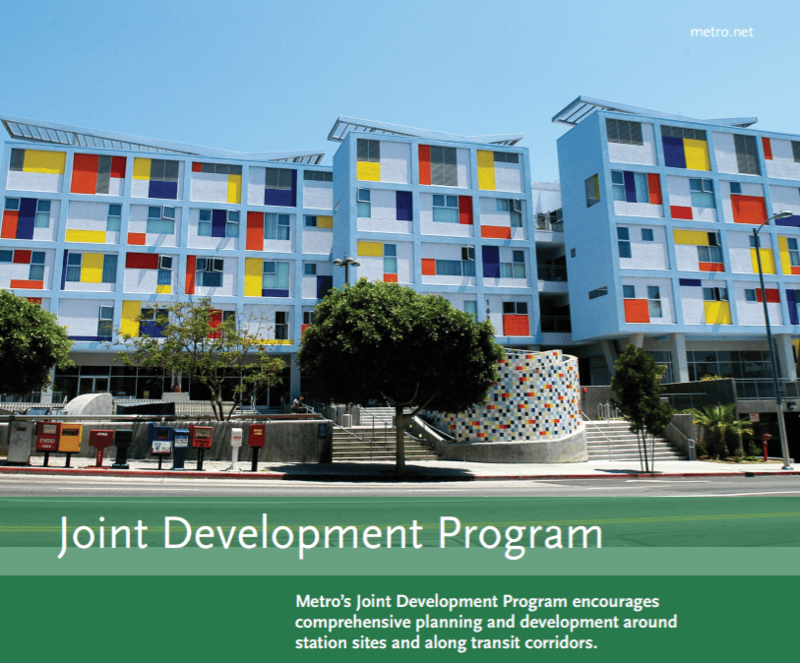 In the past, Metro joint development was often called “TOD” for Transit Oriented Development. Under new CEO Phil Washington, praised for his commitment to joint development when he led Denver RTD, TOD has given way to “TOC” Transit Oriented Communities. Today’s new policy was likely molded by Washington, but the changes have been underway since the middle of last year pursuant to a 2014 motion introduced by L.A. Mayor Eric Garcetti and others. While Metro has partnered to successfully develop housing and retail above many of its stations, from Koreatown to Hollywood to Pasadena, development has perhaps not been among the agency’s genuine priorities. Some proposed projects, including a private multi-story parking structure proposed for Mariachi Plaza, have been controversial. With new state funding, including the Affordable Housing and Sustainable Communities (AHSC) program, and a new TOC-minded CEO, future joint development at Metro sites is looking more promising. Setting an overall goal for 35 percent of joint development housing to be affordable housing. Past Metro projects completed have 31 percent affordable housing overall. In order to accommodate full environmental reviews, Metro is extending the duration of its Exclusive Negotiating Agreements (ENAs.) ENAs used to be approved for six months, and were often extended. Now they will now start at 18 months, still with possible extensions. Earlier emphasis on joint development projects providing first last miles facilities, such as walkways, bike parking, etc. For additional details, see the staff presentation [PDF] and the full 14-page revised Metro Joint Development Program Policies and Process document [PDF]. At today’s meeting, affordable housing advocates from L.A. Thrives and California Community Foundation spoke in support of the updated policy. Director Mike Antonovich expressed the lone dissent, asserting that Metro should not be using its limited resources as a landlord instead of as a transit provider. The policy still needs to be approved by the full board next week, before going into effect. This is a good policy! It solves first mile/last mile problems by having people live right near the stations and helps generate more revenue to Metro. But I think Metro needs to do more than just building apartments. I don’t think people want to continue to pay rent for the rest of their lives. Most people want to actually own their own place of residence. These things should be built for sale, not for rent. And they should build these with more units and much taller with a more wider scale project like the Koreatown condo projects; tall condos with lots of retailers on the bottom floors. LA is in a housing crisis today. We need more housing, we need more places to live. Adding a few hundred units isn’t going to solve problems when the demand for housing is in the hundreds of thousands. And I don’t think that, by itself, Metro can be expected to “solve” L.A.’s affordable housing “problem” – but they can play an important role, with the sites they own. The cover image for the report above says A LOT. Just like the old cover to Metro’s Call For Projects guidelines, this cover tells us a story about Metro’s thinking. They have professional planners on board. Planners love things like “density”, “TOD”, “mixed use”, and know all sorts of arcane incantation relevant to the law and planning practice. What most planners in the U.S. lack, however, is a practical knowledge of human-centric places that function economically, culturally, etc. The “popped up” building, the barricade to the sidewalk with nature bandaids, the huge parking garage entrance, the graffiti-ready tile column – all of it screams “we have checked all the boxes on a list that is meaningless in determining whether a place is worth caring about”. The human habitat above looks like what it is: a failure to integrate the interests of the animals that will occupy the open air zoo we call a city. You know, people; people that live in cities. Interesting, but it would be a lot more difficult to be specific about what good transit oriented development is. Criticism is easy, drawing good plans (assuming “good” isn’t a hopelessly subjective architectural concept) is hard. I would challenge you to draw up some plans for an ideal TOD and submit them for public criticism. Why they chose the Hollywood/Western development for the cover of their report is baffling – it missed the mark in more than one way, at least going by some of the complaints listed on the Soapbox LA blog. Hopefully, Metro will learn from their past mistakes like Hollywood/Western and implement better planning practices. It’s not quite a report – it’s a Metro fact sheet – and I just chose it to illustrate the article. Ignoring the albatross of the underground parking at the above site, South Pasadena’s Mission Meridian Village looks like a home run to me.